AGC Biologics has an impressive track record of success developing downstream processes for a variety of biotherapeutics including: monoclonal antibodies, recombinant proteins, complex glycoproteins, bacteria and yeast. 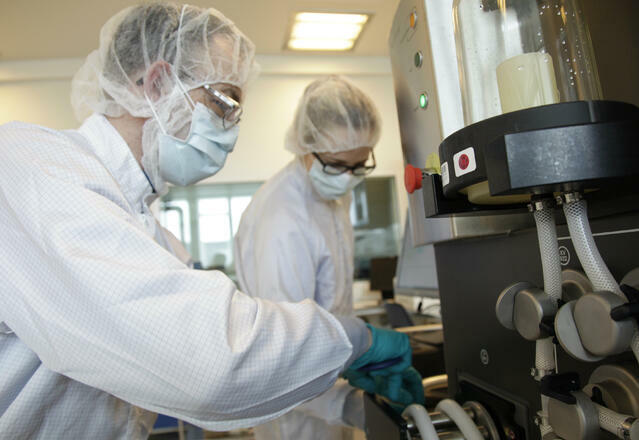 With insight gained from producing more than 200 biologics to date, we have established downstream platforms that allow us to move quickly into a product’s manufacturing phase. Our experience also enables us to develop more customized and innovative solutions to meet our customers’ needs. We optimize our downstream processes to remove impurities and increase yields with minimal steps and optimal recovery, leading to cost efficient manufacturing. For microbial processes, we have the ability to purify directly from harvest or to refold proteins from inclusion body preparations. Our process development and analytical teams are fully integrated to ensure we achieve the product quality attributes. One example includes our tailoring of processes to remove undesired product variants (such as under-sialylated molecules, aggregates and oxidation variants) to achieve your rigorous product quality attributes.